It is only because of your donations and fundraising that parents can depend on KFA to keep their kids safe and healthy. Thank you for supporting KFA’s effort to spread knowledge, share resources and help families navigate everyday challenges – from cooking, to holidays, to sending children with food allergies to school. Your donations and fundraising make all the difference! Today, thanks to your support, KFA now reaches more than 1.5 million people a year. Monetary donations are not the only way you can support KFA. Every year, many people choose to fundraise to keep kids with food allergies safe and healthy. The following are some ideas, but we’re always open to new ones. Just give us a call. Thank you very much for your interest in KFA. We couldn’t do it without you! Want to rally friends, family and neighbors to support your fundraising? We can help! Contact Erik Andersron at eanderson@aafa.org or (202) 466-7643 ext. 247 to request a free fundraising kit. Set up a Facebook fundraiser to benefit Kids With Food Allergies (KFA). Set up a Facebook fundraiser to benefit the Asthma and Allergy Foundation of America (AAFA). KFA is division of AAFA. We are happy to help set any of these up. For your birthday, you can ask your Facebook friends to donate to KFA. Create your birthday wish fundraiser on our KFA Facebook page. Are you participating in a local or endurance event such as a 5K, 10K, half or full marathon, or bike ride? Your accomplishment can help support patients and families managing food allergies. By creating a fundraising page, you can raise money to support KFA while training and participating in the event. We can provide you with a T-shirt and help you set up your fundraising page. Host your own fundraiser or awareness event in your community. The ideas are endless. Request a free fundraising kit for more ideas. 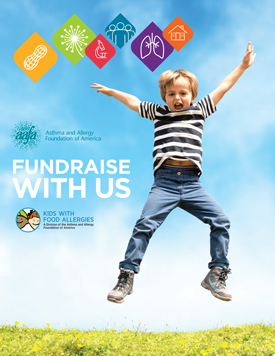 Please give generously so we can continue to work to reduce food allergy deaths and educate, advocate and support research that will allow those with asthma and allergies to have better health and quality of life.